Page, Arizona was founded in 1957 as a housing community for workers and their families during the construction of the Glen Canyon Dam. After the dam’s completion in 1960, it became the gateway to Glen Canyon National Recreation Area and Lake Powell. Water enthusiasts boat on the lake and raft the Colorado River through the Grand Canyon. In addition to water sports, there many things to do for visitors to Page, Arizona. Campgrounds, RV Parks, and chain motels abound in Page, Arizona. I selected a room at Wingate by Wyndham Page Lake Powell. A simple checkin process, clean room, and decent breakfast is pretty standard among these chain motels, and the Wingate stacks up with the rest of them. I am not the biggest fan of BBQ, but the kitchy, outdoor decorations attracted me to one of the few restaurants in Page, Arizona that had any atmosphere. I ordered the sampler plate which included brisket, pulled pork, ribs and a hot link plus two sides. The enormous portions left me with another meal! In addition, the rib meat fell off the bones and thankfully none of it was slathered in BBQ sauce! I got to choose, how much, if any BBQ sauce I wanted to add. In this case, I actually used the regular sauce as it was tasty! Antelope Canyon, whether it be Upper or Lower, is a MUST SEE! The canyons are different from another with the Lower Canyon being a V shape and the Upper being an A shape. The Lower Antelope Canyon is famous for its rock shapes while the Upper is famous for the light rays that shine through the canyon. The light rays, however, don’t shine through the canyon in winter months. As such, I visited Lower Antelope Canyon. Both canyons require a tour and Indian Reservation permit. The Upper Antelope Canyon Tour costs around $70 while the Lower Antelope Canyon Tour costs $48 including the permit. Two sister companies, Ken’s and Dixie Ellis, offer tours every 15 minutes from morning to evening. The best time to visit Lower Antelope Canyon is early morning or late afternoon. The best time to visit Upper Antelope Canyon in lunch time. The Lower Antelope Canyon tour is approximately 1 hour and covers the distance of one mile. The guides know exactly where to capture images for phenomenal photography. Take their advice! Glen Canyon Dam is located just on the west side of Page, Arizona. The dam which stand 711 feet high is the 2nd tallest dam concrete arch in the USA. Only Hoover Dam is taller. 4.4 million cubic yards of concrete was used to construct the dam which was completed in 1963. The visitor center includes excellent, informational exhibits and amazing views of the dam, lake and bridge. 45-minute tours for $5 take place 4-7 times a day on the half hour depending on the season. Reservations may only be made in person 24 hours in advance. The Glen Canyon Overlook is less than a 10-minute walk from Wingate by Wyndham Page Lake Powell. For a restful lunch, bring a picnic and look out on the dam and river below. The water sports options near Page, Arizona are endless. The Antelope Canyon Tours offer a combined ticket to kayak on Lake Powell before touring the canyon. Other boating options include renting a houseboat for an extended stay on Lake Powell or a multi-day raft trip down the Grand Canyon. Horseshoe Bend is located just 5 miles south of Page, Arizona making it an extremely popular hike among tourists. Visitors walk up a small hill before they descend a sandy trail to an overlook. Hikers are rewarded with the blue river bending in a perfect horse shoe between the tall, red canyon cliffs. It’s vicinity to Page and it beauty attract many people from sunrise to sunset. For less crowds and a much more strenuous trail, try Lees Ferry and Spencer Trail Lookout. This trail is located in Glen Canyon National Recreation Area, a fee area, about 45 minutes south of Page, Arizona. The 3.8 mile hike begins at Lees Ferry Historic Townsite which is also the entry point for many rafting the Grand Canyon. The townsite dates back to the 1870’s when leaders of the Mormon Church wanted to colonize Arizona, but canyons blocked the way. The only place to cross the river for hundreds of miles was this section of the Colorado River. Wagons loaded onto Lee’s ferry. Lee, one of the perpetrators of the Mountain Meadow Massacre, was exiled here to operate the ferry. The Mormons constructed the Lees Ferry fort in 1874. Charles Spencer added most of the rest of the buildings in 1911 when he opened a gold mining operation. While Spencer preferred to haul his coal by wagon, his Chicago investors voted to build a steamship. The steamship was not powerful enough to withstand the Colorado’s swift currents and sank on its maiden voyage! Take a short detour past the turn off to Spencer’s Lookout for a glimpse. The climb to Spencer’s lookout is steep without any shade. It is best to take this hike in cooler months or to carry lots of water. The stairmaster like workout, however, is worth the reward at the top. The view is similar to Horseshoe Bend without the crowds. For that matter, without anyone else. It is a wonderful place to enjoy the beauty and solitude of the Grand Canyon. The Navajo Bridge is located just before the turn-off to Lees Ferry, so plan to visit both sites when in the area. 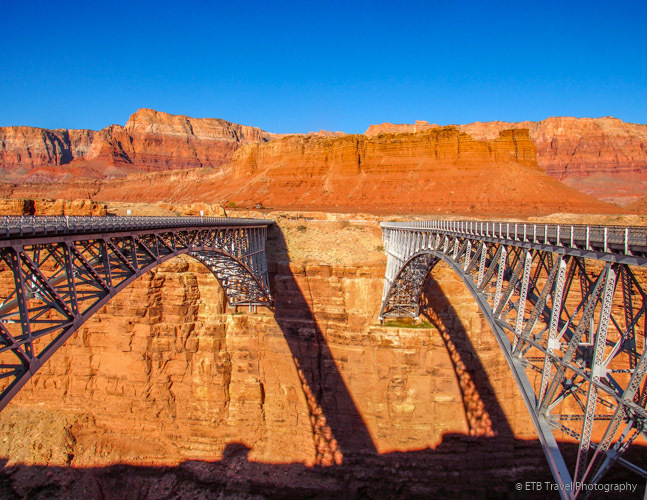 At the time of construction, the historic Navajo Bridge was the highest steel arch bridge in the world! The bridge was constructed in two cantilevered arch halves that took 2 to 2.5 months to build. Each half was raised into place and they were connected in September of 1928. The historic bridge fields foot traffic while a stronger bridge, erected in 1995, supports the much heavier carloads of today. The Wave is an extremely popular hike near Kanab, Utah which requires an elusive permit. In person, there is less than a 6.5% chance of winning the daily lottery. Online, the chance drops substantially. As a result, the New Wave, with similar rock formation has become an alternative place to visit. Lots of people pose like surfers on the wave-like pattern. Toadstool Hoodoos is located about 30 miles northwest of Page, Arizona. A toadstool is a spire-like feature with a boulder perched on top. It is formed when wind and rain erode the softer rock and leave a column. The parking area for the Toadstool Hoodoos, part of Grand Staircase Escalante National Monument, is right of Highway 89. The hike to these strange rock formations is only 0.8 miles one way. The area invites exploring which can increase mileage and travel time. The North Rim of the Grand Canyon is just 2.5 hours away from Page, Arizona. It is open from May 15 to October 15 with day use only access through November or until the first snow. The more remote North Rim is great way to enjoy the Grand Canyon with less crowds. There are many hikes and overlooks to investigate.